Scientific name: Order Lepidoptera, several families, many species. Identification: Beautiful big wings and long antennae with clubbed tips. Biology and life cycle: Complete metamorphosis. Larvae are caterpillars, many of which eat plants and are troublesome. Feeding habits: Adults eat nectar from flowers. Economic importance: Pollination and garden beauty. Natural control: Wasps, birds, lizards, and predatory flies. Organic control: Bacillus thuringiensis sprays if really necessary. Insight: This is an example of those insects whose life forms are both beneficial and harmful. Adult butterflies pollinate flowers and provide garden beauty, but the larvae or caterpillars can be very destructive pests. Butterflies should be protected because they add beauty and fascination to nature. It would be a dull environment without them. The monarch butterflies have pupal cases that look like jewelry, and the giant swallowtail has larvae that look like bird droppings. 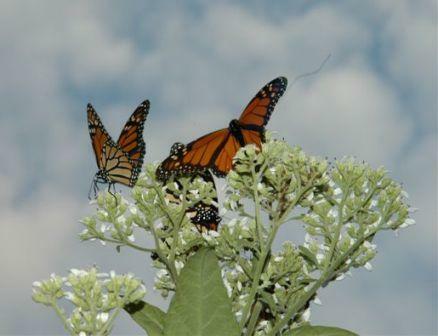 To attract butterflies, plant many varieties of flowering annuals, perennials, vines, shrubs, and trees. Biodiversity with many different flower colors is important for attracting butterflies.